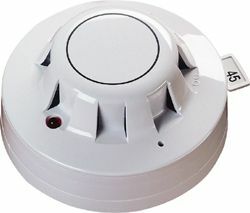 The Apollo 55000-650 is a photo-electric smoke detector from the XP95A range of UL sensors. This unit is ideal for use on Apollo protocol fire alarm system loops and is specifically good at sensing slow burning or smouldering type fires. For more information on Apollo 55000-650APO detectors call us NOW on 01200 428 410. In addition to the Apollo 55000-650 APO Smoke Detector we can also supply a wide range of Apollo products, including the Alarmsense, Orbis, Discovery and Series 65 ranges of equipment. The Apollo Alarmsense range of equipment is ideal for small to medium sized fire alarm system installations. This system allows for the installations of detectors, call points, sounder and beacons on the same zone circuit. This is ideal for reducing installation costs and time. To compliment the range of XP95 system equipment, there is also the Apollo Discovery range of devices available. These devices offer a more advanced detection solution than the XP95 devices, yet still feature the same attractive styling. If you’re interested in this equipment you may also be interested in our Apollo Fire Alarm Equipment and Briton 996 Door Closer ranges.